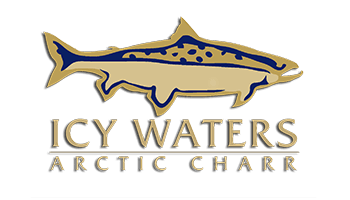 Available 52 weeks per year in dressed or fillet format, Icy Waters Arctic Charr is processed and shipped fresh within hours of harvest. Having a light, sophisticated and fresh taste, Arctic Char is great for many menu offerings due to its broad appetite appeal. Fillets: Available in either 6-12oz or 12-20oz sizing with pin bone in or out. Fillets are packed in 40lb master cases containing four 10b trays. Perfect for restaurant, wholesale or retail sales. Dressed: Available as dressed, head-on and gutted in either in 1-2lb or 2-4lb size categories. Dressed product is packed in wholesale 30lb or 50lb cases, depending on customer needs. Special Order: Special cuts, portioning, skinless, or individual vacuum-sealed options are available for special orders. Opening the fillet tray or case should show product with a fresh aroma and consistently firm flesh with a bright coral colour. Dressed product should be independently tagged, with clear eyes, moist, muculent skin and a fresh aroma. Icy Waters Fresh Arctic Charr is processed, under the watchful eye of the Canadian Food Inspection Agency (CFIA) in a federally approved Hazard Analysis and Critical Control Points (HACCP) certified processing plant, then packaged and shipped with great care and concern so it arrives in perfect condition, just waiting for the most discerning of chefs to create their masterpiece.